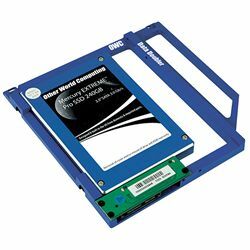 Add up to an additional terabyte of internal storage with the OWC Data Doubler. First install any 9.5mm-high 2.5" SATA drive into the Data Doubler frame... and then install the entire assembly into a MacBook or MacBook Pro optical drive bay. Installed drives are recognized like any other SATA device and can be setup and partitioned using the Apple Disk Utility application. Includes 5-piece toolkit, screws and detailed installation guide. Compatible with MacBook Pro 17" (Early 2009/Mid 2009/Early 2010/Early 2011/Late 2011), MacBook Pro 15" (Late 2008/Mid 2009/Early 2010/Early 2011/Late 2011), MacBook Pro 13" (Mid 2009/Early 2010/Early 2011/Late 2011), and MacBook 13" (Late 2008/Late 2009/Early 2010). Laptop and hard drive not included. Does not support SATA 6Gbps drives.